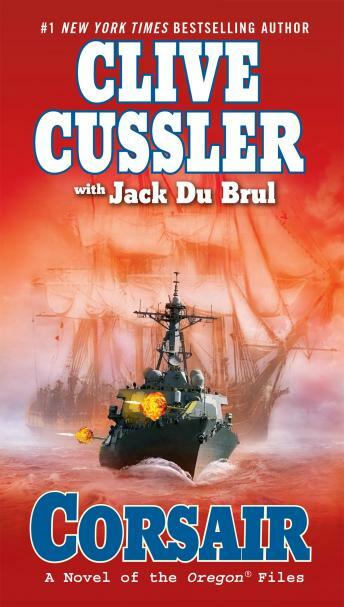 For five novels, Clive Cussler has brought readers into the world of the Oregon, a seemingly dilapidated ship packed with sophisticated equipment, and captained by the rakish, one-legged Juan Cabrillo. And now the Oregon and its crew face their biggest challenge yet. Corsairs are pirates, and pirates come in many different varieties. There are the pirates who fought off the Barbary Coast in the late eighteenth and early nineteenth centuries, the contemporary pirates who infest the waters of Africa and Asia, and the pirates . . . who look like something else. When the U.S. secretary of state’s plane crashes while bringing her to a summit meeting in Libya, the CIA, distrusting the Libyans, hire Juan Cabrillo to search for her, and their misgivings are well founded. The crew locates the plane, but the secretary of state has vanished. It turns out Libya’s new foreign minister has other plans for the conference, plans that Cabrillo cannot let happen. But what does it all have to do with a two- hundred- year-old naval battle and the centuries-old Islamic scrolls that the Libyans seem so determined to find? The answers will lead him full circle into history, and into another pitched battle on the sea, this time against Islamic terrorists, and with the fate of nations resting on its outcome.